Lucy Sabin in Travel on 27 January, 2016. Authentic food was another aspect of Finnish culture that I felt privileged to experience at Korvala. Every dinner the Näsi clan prepared for us was simple and delicious. A particular delicacy: tender reindeer meat with tart cranberry sauce. I usually stick to a vegetarian diet… but I made an exception for this one exceptional meal. It would be a shame to miss out, is what I usually tell myself; last time I backslid it was alpaca steak in Peru. Ironically, the following day we were to be taken on a reindeer ride. On encountering the beautiful, tawny creatures in the morning sunlight, I felt a guilty pang for the previous’ night’s feast. Considering that they run wild eight months of the year, these reindeer were so docile and gentle in human company. You just had to keep a wary eye on their lethal antlers in case they jerked their heads up betwixt grazing on sticks poking through the snow. 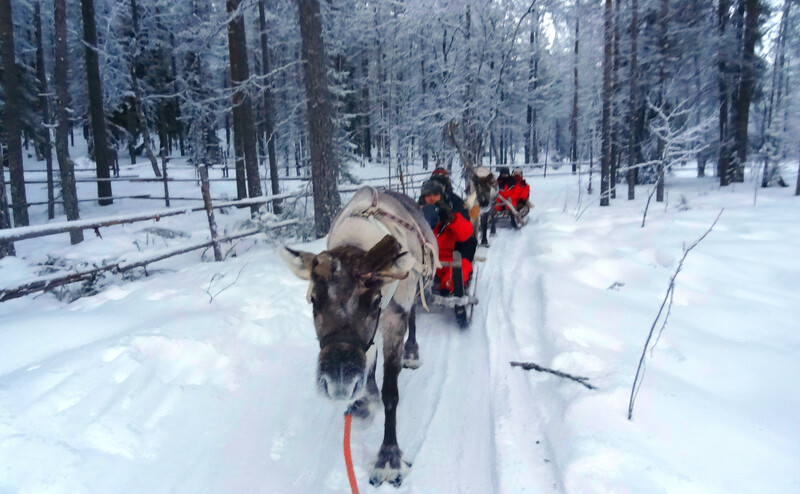 The reindeer jaunt turned out to be as milling as the husky ride was exhilarating and hairy. Boy could these dogs eat snow! 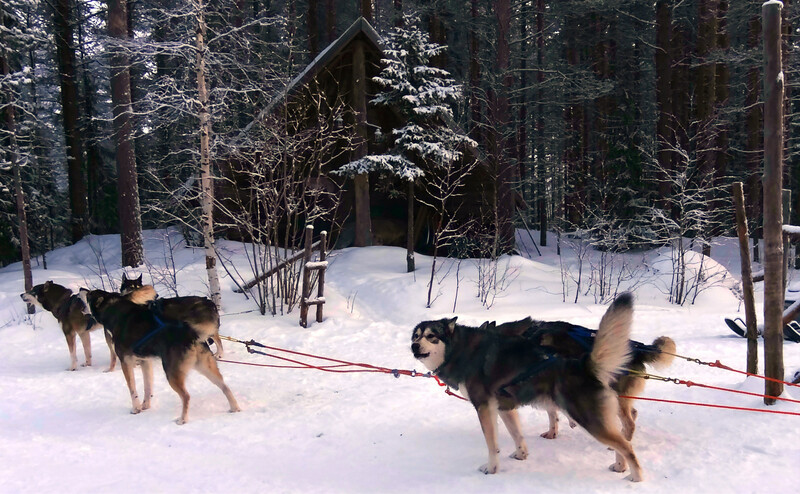 Bred for maximum strength and resilience, the Siberian huskies at our lodge bore little resemblance to the fuzzy pooches in the Ralph Lauren adverts. Smaller, compact, inquisitive, endearing odd-balls they were, with eyes of different colours and piebald fur coats. Each pedigree seemed to have its own distinct quirks and personality. I fell in love with a pair of brothers who would roll over as soon as you activated the trigger switch behind their ears. Of course, a typical tic of the husky is its yearning howl. From a distance the combined canine chorus sounded like some mysterious Northern wind. Letting her rip on the home stretch, Korvala. Out of all the novel activities I dabbled in, bombing through the forest on a snow-mobile topped them all. I felt very 007 negotiating hairpin bends and climbing steep, snow-peaked hills, as gnarly as granddad’s Christmas cakes. The headlights of our procession were yellow balls of fire hurtling through the monochrome landscape of crystalline white striated by spindly tree trunks. It felt surreal to be within reach of the “Arctic Circle” itself. With all its fictional connotations, the geographical location occupies a half-imaginary, half-real realm of my brain. But for the four million people who live here all year round, this is normality. 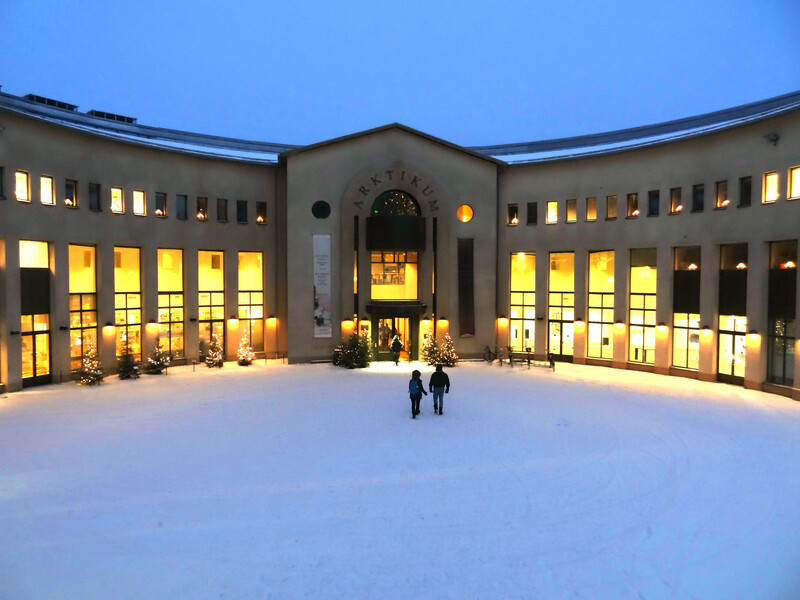 It was completely eye-opening to discover more about the realities of life in the Arctic at the Arktikum museum in Rovaniemi, the nearest city at an hour’s drive from our lodge. Visiting the imposing Arktikum museum, Rovaniemi. Surrounded by gargantuan snowmen and trussed up trees, in ‘Santa’s Village’ I felt as if I had landed on the set of The Grinch. In spite of myself, I was invaded by a vague nostalgia. It was particularly touching to see, in the functioning Post Office, shelves upon shelves of letters to Saint Nick from all over the globe. One envelope with a Honduran stamp simply read, “Santa, North Pole”. This Santa must be the real deal—he speaks every language! 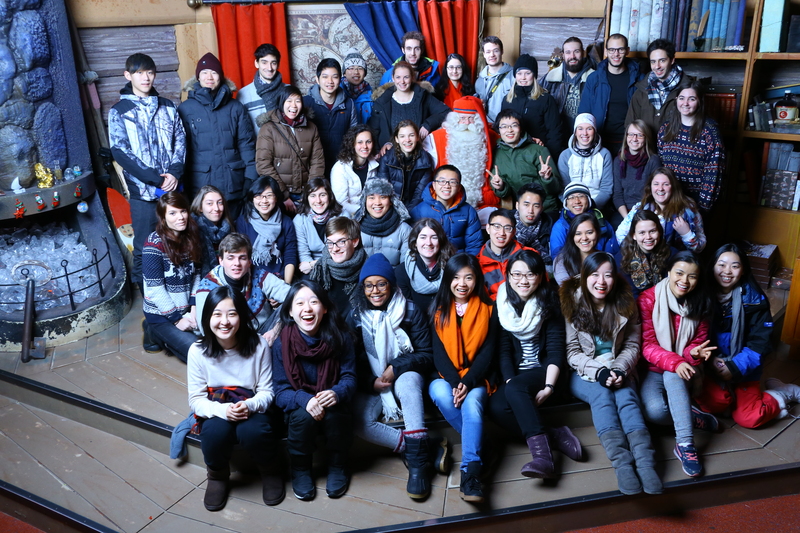 Our international expedition group at Santa’s Village, on the Arctic Circle line. The commercial aims of Santa’s Village stood in stark contrast to the harmonious way of life of the native people in Lapland. Learning about their culture and experiencing it first-hand turned out to be the priceless highlight of the expedition, for me at least. By heeding local wisdom and customs, I was able to overcome the cold, actually managing to embrace it as ‘fun’ and a ‘challenge’. 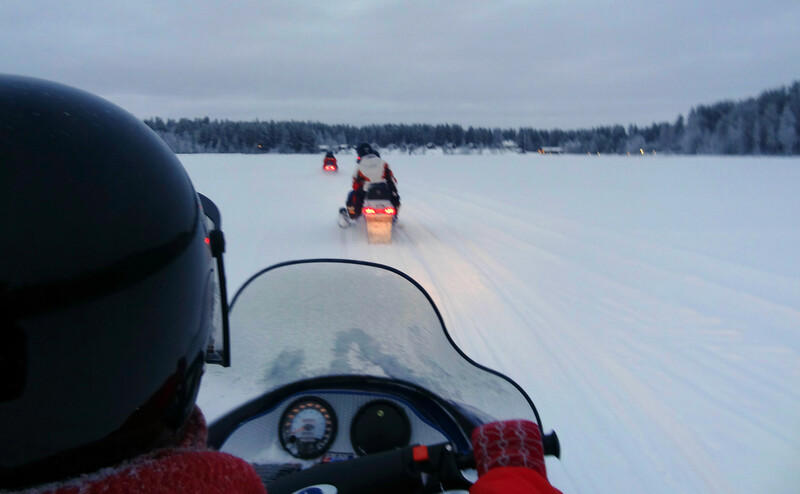 Surprisingly, visiting Lapland proved to be an antidote to the overdose of commercialism the Christmas period can bring. Memories I shall cherish most from the trip are surprisingly simple: passing an iron kettle of hot wine around the fire in the Tipi and sharing stories with my new friends from around the world; waking up to a beautiful lemony sunrise which sets the treetops on fire; and tasting homemade Finnish ‘bread cheese’ baked in cream and cinnamon… mmm….